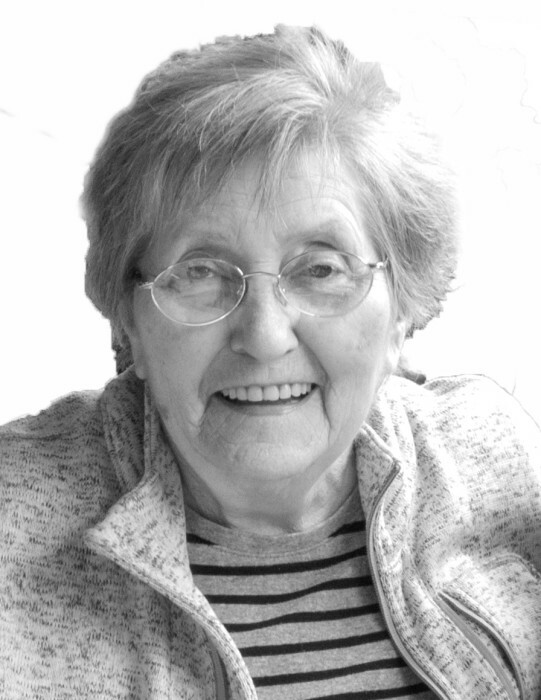 Thomaston – Mrs. Jeannine C. (Cote) Royer, 86, passed away on Wednesday, January 23, at Valerie Manor in Torrington after a long battle with Alzheimer’s. She was the widow of Ernest N. Royer. Mrs. Royer was born August 1, 1932 in Beaumont, Quebec, Canada, daughter of the late Louis Emile and Marie Reine (Fortin) Cote. Jean was known by everyone as Mommy Jean. She was born in Beaumont, Quebec, Canada the seventh of thirteen children, and eventually the family would move to a farm in Lennoxville, Quebec, Canada where she would meet her husband. The family would immigrate to Vergennes, Vermont when she was 17 to a farm. She would marry in Vergennes, Vermont in 1952. They would move four more times before finally settling in their first home in Thomaston, Conn in 1972. She was renowned with her skills with needle and thread. She could cook, can fruits and vegetables, paint, wallpaper, plaster walls, swing a hammer and use a screwdriver with the best of them. She had a passion for gardening and especially loved her peonies. She did whatever it took to make a home a home for her family. She loved her children, grandchildren and great-grandchildren as well as all her brothers, sisters, brothers-in-laws and sisters-in laws and they all adored her. She left her mark with everyone that met her. There was always room at the table for anyone in need of a meal and always had a spare bed for anyone that needed a place to stay. She was always generous with her hugs and kisses to not just family but to all who knew her. No matter what adversity that would be thrown her way, and there were many, she would tackle it head on and deal with it. She was loved and respected even by the staff of the nursing home. She was known for always having a smile on her face and the look of mischief could be seen in her. Her willingness to help others in any capacity she could, was another one of her strengths. She will be greatly missed by all that met her. She is survived by her daughters, Chris (Peter) Cipriano, of Prospect, Joanne (Theodore) Pickett of Brighton, Colorado, Tina (Lester) Duffy of Morris, Michelle (Joseph) Pratt of Goshen, her sons, Bruce Royer and Thomas Royer (Laurie) of Thomaston and her son-in law Paul Rozum 20 grandchildren, Deanna Cipriano, Tracey (Ralph) Anderson, Chantelle (Byron) Pangburn, Paul (Diana) Rozum, III, Larissa Rozum, Michael (Kate) Pickett, Sean (Kim) Pickett, Emily (Steve) Bennett, Erin Royer, Renee (Anthony) Salamone, Bryan (Ashley) Duffy, Jennifer Duffy, Jessamy Pratt, Abigail Pratt, Ethan Pratt, Harper Pratt, Lauren, Jeremiah, Josh Royer and Ashley Royer. 19 great-grandchildren, Samantha and Lila Anderson, Amelia and Alan Piatt, Ian, Malachi and Gabriel Pangburn, Paul Rozum IV, Brendon and Collin Pickett, Emory and Reese, Jackson O’Brien, Miklin and Mia Salamone and Colton and Raegan Duffy and Elizabeth Royer; 2 brothers, Richard (Fabienne) Cote of Auburn, NH and Leopold (Karen) Cote of Thomaston; six sisters, Edith Bordeleau of Charleton, MA, Veronique Drouin of Edmonton, Alberta, Canada, Bridget (Marcel) St. Laurent pf Sturbridge, Madeline Farland of Southbridge, MA, Angel Spear of Elbert, CO and Elaine Carlson of Worcester, MA; as well as 66 nieces and nephews. She was predeceased by her daughter, Carol Rozum; her grandson, Louis T. Cipriano, II; 2 brothers Vincent and Raymond Cote and 2 sisters Louise Grondin and Geneviève Nadeau as well as 9 nieces and nephews. The family would like to thank the staffs of Litchfield Woods and Valerie Manor for all the years of care, respect and dignity given to Mommy Jean and her family.